Paul Cook has admitted his interest in bringing Paul Mitchell to Pompey in a recruitment role. But the Blues boss insisted, at present, nothing has been arranged. Mitchell worked as Cook’s chief scout at Chesterfield before the Scouser departed for the south coast in May 2015. He rejected overtures to follow him to Fratton Park and was rewarded with the position of director of player recruitment/development under replacement Spireites boss Dean Saunders. However, Mitchell left the League One club on Monday after six years in search of a fresh challenge. That has again alerted Cook, who is keen to improve Pompey’s recruitment infrastructure. Mitchell has since been down to the club’s Hilsea training ground to visit Cook and former colleague Leam Richardson. And the Blues boss conceded he is monitoring the situation. He said: ‘Mitch has been released, he has been down to see us to say hello, that’s good. ‘He has left his post at Chesterfield and is friends with me, friends with John Sheridan (Oldham) and friends with Lee Johnson (Bristol City), so as he goes and visits them they will all be linked with him, I guarantee that! ‘Football is like that, he is a very good friend of ours, I can’t stop stuff like that being talked about. ‘At the minute there is nothing in it but, going forward, if Mitch was out of work we would certainly look at getting him involved with us as a club. ‘I am not going to say there is nothing in it – but at this minute in time there is nothing in it. Pompey have been without a head of recruitment since Andy Melville departed last May. 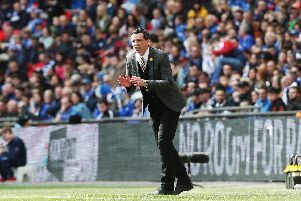 The former Welsh international defender’s 70-day stay as head of player recruitment was ended upon Cook’s arrival as Blues manager. Melville had been appointed by Andy Awford in a bid to strengthen the recruitment department. Yet Awford left as Pompey’s manager four weeks later – and his replacement opted for a clear out of the backroom he inherited. Earlier this year, Cook employed former Dagenham & Redbridge manager Wayne Burnett to identify players across the south of England. At the time the 49-year-old insisted it was just the beginning of revamping the club’s scouting and recruitment. Now he has the opportunity to step up improvements following Mitchell’s sudden availability. Mitchell also operated as chief scout under Cook’s Chesterfield predecessor Sheridan. Last summer he turned down the chance to be the Blues’ technical director to remain with the Spireites.